A Jolly, Weary and Magic Winding Down of the Year. And Me. Giant Boy is in the kitchen with his girlfriend Lucy Love Hearts, and I am convinced that he is just a giant labrador puppy in the wrong body. If Lucy Love Hearts suddenly threw him a ball I wouldn't be surprised if he dropped what he was doing and caught it in his mouth. To show LLH how much he cares, he lets her do boxing with him, and she, bless her, refuses. Somehow the relationship works, and both are happy enough. They are eating bananas and custard in the kitchen right now, and the subject of boxing has been overtaken by pudding. A lovely simple life. And I, I am happy too. I am sitting on my sofa, wrapped in a fleecy jacket, with a pot of tea beside me, and darkness outside. It truly is winter and if I wasn't so busy, going to bed now for a few months would be a good idea. This is the time of year we are all very tired, the year is ending and we feel as if we were ending too. If only we could all stop, we say to ourselves, if only we could just sit down quietly and let the rest of the year finish itself without us. We'd like to take part, we would say, but if it is all the same to you, we are going to sit down and wait till April. This is precisely how I feel, and because I am generally full of empathy, I think you feel the same way too. There is, however, Christmas to deal with. Jolly good, I say, jolly good. But oh, can someone else do it for me? Well this year, someone is doing it for me, and I look forward to it hugely. My oldest brother and his girlfriend have taken a cottage near here and we are all staggering there to join forces and feed each other and make sure no one stands for more than ten minutes unaided. When my children were younger, Christmas was hysterically exciting. It was about glitter, tinsel, trees and shopping trips. There was huge competition as to who would lay out the presents under the tree, who would decorate the tree (my children were not team players, each was a leader in a despotic sort of way) and who would dish out the presents on the actual day. Usually all three tasks went to one incredibly powerful child who had eliminated all competition on day one, and because I was bringing up the children on my own, trying to work and stay sane, I let them be as long as they could still speak to me in sentences and seemed to have had enough to eat. We didn't put stockings at the end of the bed, or socks, because no one had big enough feet to satisfy my babies that enough presents would fit in to a single sock. So we had empty pillow cases. Dutifully, both brow beaten by my alarmingly power mad kids and half delirious with the Christmas magic myself, I managed to fill up these pillow cases with all sorts of small items in large boxes and so preserve the Christmas spirit. I always had a very large tree, which when I came to Bognor, I bought from a family of red haired gypsies in a lay-by each year. The kid who sold me the first tree, a sturdy fiery haired lad with a fantastic business sense and aged only about ten, told me he was a boxer. His mother backed this up from a van nearby and called out that he was a local champion. Well done, I said, and he flexed his muscles and fixed me with a beady eye. I paid up and he smiled and looked pleased. His mum looked like a boxer herself, so I assumed that when they weren't selling Christmas trees in a country lay-by every cold December, they had a nice little line in boxing as a mother son duo, fighting side by side against opponents terrified by the flaming red hair and the unlikely smell of pine needles. This year, I got a smaller fake tree. But the last time I saw him, my red headed boxer lad was a lot bigger with the scars of battle on his face. I bought my tree and asked how the boxing was going. Yeah, he said with a smile, I'm still the champion. I wondered what his Christmases are like, and as his mum wasn't in the van I wonder what had happened to her. Gone to the great lay-by in the sky, I thought, buried beneath a pine tree somewhere with a pair of flaming red boxing gloves hanging reverently in the tree above. So this year, I have a five foot fake tree that arrived flat packed ready for self assembly. I self assembled it in about ten minutes. A tasteful few baubles, some lights, and that was that. I have only Giant Boy left at home, and he has other things to do than help his mummy put up a fake Christmas tree on a Sunday morning. In the past, the tree looked like it had been paint bombed with baubles and glitter by drunken aliens, tinsel and lights decorating the walls, the staircase, the floors, and the bath. Once or twice when Giant Boy was a baby he was decorated too. We used to sit him in the laundry basket and give him saucepans and wooden spoons to play with which meant he didn't notice being wrapped in tinsel and hung with baubles. Christmas decorations were not a well thought out design feature in our house, it was a full on creative explosion from some seriously determined kids. This year, my tree is subtle, and precise. It went up in the hallway quickly, and it will go down as soon as possible after Christmas, and all will be well. My daughter, Fancy Girl has her own Christmas tree and has all that she ever wanted in her own place. There is no one to fight for total control, she is happy and fulfilled. I will never know if she decorates her fiancé with tinsel and fake snow, or not. That will remain their business. My other son who has chosen a difficult and different path, will have his Christmas somewhere and I send him all my love. Giant Boy is too busy to get involved, training our deeply giving and anxious Polish lodger to box, and lolloping around Lucy Love Hearts waiting for her to throw a stick for him to fetch. The studio is looking wonderful. It is the place to be. I have outdoor fairy lights hung around the door, and if I put on the heating a good while before I go in there, with the fairy lights, it makes crossing the garden in the wind and rain a much more manageable affair. I have even been wearing my old painting dungarees and a hat so that I am both warm and prepared to get dirty. That, in painting terms, means business. 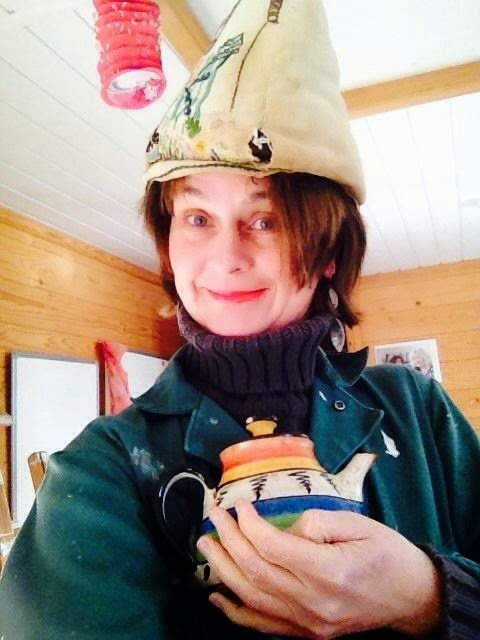 I hold the teapot and wear the hot tea cosy on my head. Thinking outside the box. Clever Artist Extraordinaire. I have cut down on all my activities outside in order to spend more time in the studio painting. There are a lot of paintings to complete by mid January, including five portraits and a new painting in the God's Life series, this time it is God's School Day. As with God's Kitchen and God's Study, this will be a snap shot of God's day at school just as God leaves the desk and goes to get changed for games. We sneak a look at the desk and the work on God's desk, before God comes back and we have to go. I have Fr Dominic to complete for A Graceful Death. Dominic's portrait has begun, and I am doing him a bit at a time. It needs to be done for next year, as AGD will go to the Dying to Know event in Bournemouth in March, to Shrewsbury in May and I hope, oh I hope, to Worthing for the Dying Matters Awareness Week in late May. I am waiting to discuss the venue in January, and will enjoy bringing AGD nearer to home. 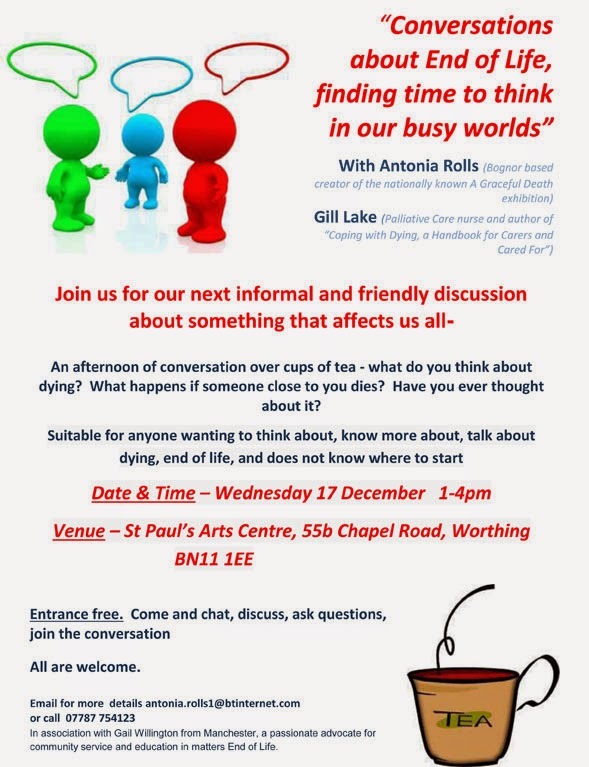 The next "Conversations about the end of life, finding time to think in our busy world" is coming up at St Paul's Arts Centre in Worthing. Hooray. December 17, Gill Lake and I will be hosting a Conversations and we will be taking three hours instead of the normal two. We feel that there might be more to talk about as Christmas is coming up and everything closes down. People may feel isolated and afraid around this time, and so Gill and I want to spend more time chatting with you all. The latest Conversations just needs you to come along and join us. This past year I have worked hard. I have painted paintings, written things, organised talks and exhibitions, talked to people about stuff I can do, had meetings with interested parties, and sat with dying people. But what is uppermost in my mind right now, is magic. As the year drifts to an end, all that happens in my life still happens, but I am aware of something else, something invisible, lovely, uplifting and precious. It may be just the energy between people, it may be the kindness of those around me, it may be that I am being given insights into things that I need to see more clearly. Big things matter. They matter a lot, and they are big enough to be seen. Everyone notices a big thing. I put A Graceful Death on somewhere, and it is big enough to be well and truly noticed. Gill and I host a Conversations, people come, it's all go and everyone knows it is happening. But there are moments of such small loveliness that my heart expands, and my mind is grateful. These moments are tiny fragments in time, over before you can grasp them, deeply meaningful and very private. I sat with an agitated person recently, an elderly, large and strong person in the last stages of illness. When someone is agitated, and disconnected, and dying, who knows what they are really thinking and feeling? I want to go home, said my friend, trying to get up and leave. I said, you can't, you have to lie down, you are too poorly to get up. And then I held their arms and said, very gently, Lie down my darling, lie down and find your safe space. You are doing so well, so well, and it is not easy, but you are doing so well. I stoked my friend's forehead and eyebrows, and held their hand. At that moment, my friend turned and looked at me with such warmth, such connection, such intensity that I felt the gift of grace pass from my elderly, struggling friend, to me. A gift of grace, a moment of truth, a soul to soul communication and I, in my life, can only benefit from that blessing. My friend died a few days later, and I carry that moment as a gift. That is what I mean by magic. Perhaps that is how I will end December's blog. With a gift of grace, magic and connection for you. Over this Christmas, I wish you love and kindness. I wish, because it takes no time to do, for this moment, a blessing just for you. And if you want to decorate any of your family in tinsel and glitter, do it now, while the power of the blessing I have sent you has rendered them incapable and you superhuman. See you in January. Exhausted Angel, even Angels want to go to bed till April.